The Hitachi FineSAT V series is offered as non-destructive equipment for detecting and imaging microscopic structures or defects inside semiconductors and electronic components by use of the reflection and transmission properties of ultrasonic waves. In response to increasingly sophisticated needs in recent years, the FineSAT Ⅴ is developed by enhancing the functions of the Hitachi FineSAT Ⅲ system and enabling measurement and inspection at improved precision and speed. Hitachi FineSAT Ⅴ is equipped with independently-developed data processing software and a newly-adopted 64-bit processing system, combined with a high-speed, high-precision scanner, shortens inspection/analysis time. Ultrasonically measured data of up to 400 million points in standard specification and up to 2 billion points in optional specification can now be stored and processed. With Hitachi FineSAT Ⅲ, the minimum measuring pitch was 40 µm when imaging an 8-inch wafer in single measurement. In contrast, Hitachi FineSAT Ⅴ can obtain and image data in 20 µm pitch in standard specification and in 10 µm or smaller pitch in optional specification, enabling detailed measurement of a large sample in a single scan. It also enables various image displays that support high-precision analysis/evaluation. When measuring a large sample such as a wafer, the measurement time is largely affected by the scanning speed. The measurement time of Hitachi FineSAT Ⅲ is shortened by 25% (*2) by reducing the ultrasonic pulse generation cycle by half in addition to using a high-speed scanner. 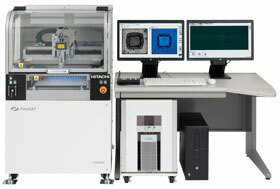 The maximum scanning speed of the scanner excluding acceleration and deceleration time has improved to 2,000 mm/s (*3). The newly designed highly-rigid frame suppresses equipment vibration, producing crisp images even from high-speed scanning. In consideration of its use in a clean room, it is equipped with a flap-type scanner door. An antistatic-type transparent panel is also available as a door option for better dust proofing. The lower front window can be fully opened by rotating it 180° downward, so that the stage frame can be easily removed and attached when setting a sample or performing maintenance work. The main unit’s control section adopts an antistatic panel to suppress the effect of static electricity on the operator. The lifter can be moved up and down by simply turning the power of the main unit on. It moves without activating the Hitachi FineSAT software. The standard equipment is fitted with a local switch box. The conventional method of moving the probe inside the scanner was to operate the buttons on the monitor screen with the mouse or operate the keyboard, while shifting the eyes alternately between the probe and the monitor or the keyboard. Use of the local switch box allows minor adjustment of the probe positions without taking your eyes off. The monitor screen size is now 23 inches, significantly improving visibility in data analysis and ease of operation. A dual monitor option is available.